I love getting manicures and pedicures, but they are pricey and it's hard for me to have time to myself to get one. Not to mention we have all heard horror stories about infected nails, which is bound to turn anyone off getting one! Look around the salon to make sure it is hygenic and clean. If nail clippings are left on the floor or the shop looks messy, go somewhere else. Due to the chemicals, the salon should be well ventilated. 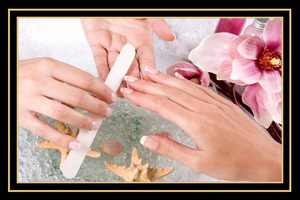 Both you and the nail technition should wash your hands before starting and after finishing. Just because they might wear gloves, it doesnt mean their hands are clean. Make sure they don't have any skin conditions that can infect you. Also don't go to a salon if you have a hand or foot infection. Make sure they steralise their equipment before using it on you. This includes foot baths. If you are ever worried, bring your own tools, or just DIY at home. Don't get the cuticles cut. Just push back, or leave them alone. You can fix it up at home if you are concerned about infections. A manicure or pedicure shouldn't be painful. Tell the technician straight away. A manicure or pedicure shouldn't make you bleed either. Your risk for infection is huge once they cut into your skin. If you have time, watch another customer get it done. Watch if they clean the footspa, reuse the same (dirty) instruments and wash their hands. Make sure they never reuse water or towels to another customer. If you are pregnant, stay away from nail bars. Due to the chemicals and risk of infection, it is just safer to DIY, your if can't see your toes anymore, get a friend to do it for you. If you really want to go to one, make sure you bring your own tools, ask to be in the most ventilated part of the room or wear a mask. Nails should be filed in only one direction. Otherwise you will weaken and damage your nail. I went to one where they just sawed at my finger instead of filing one way, argh made me cringe! I've nominated you for the Versatile Blogger award! Pop over for more details. I was getting acrylics put on before and the guy cut me :( He said it was my fault as my hands were not relaxed enough! I will never get them again though too much hard work and they throbbed for ages after and were a nightmare to get off! Ohh Jimmi Lou, what an idiot!! I find acrylics just make things harder to open! I'm currently studying beauty therapy and I've got a few tips! Don't ever ask a beauty therapist to cut your "cuticles" - if they're well trained they will refuse anyway. Everyone thinks the cuticle is the ridge of skin at the base of the nail. this is actually the eponychium which is living tissue (a "nail guardian") and if cut can cause horrible infections and trauma to the nail and if done over and over - scarring, so it comes back thicker and tougher. They should only use a cuticle remover solution and cuticle pusher to remove true cuticle, which is dead skin on the nail plate and to very gently/slightly ease back the eponychium as if they're too forceful that could also cause the seal to break. if your "cuticles" (for the layman) are over grown, moisturise twice everyday and they will soften up and shrink back slightly and will look so much better than if they were cut! You should ask if they use new or sterilised instruments on each person, and if they disinfect foot spa baths after each person. If they don't, don't go there! diseases and infections could spread that way. Don't go to a place that uses an electric file on your natural nail for nail enhancement prep! They should only "take off the shine" by lightly buffing each nail in a downward motion, if acrylics are applied and removed with care there should be no real damage, definitely no chunks out of nails like my previous experience at one of those cheap salons!